“The art of money” is more than a phrase when it comes to Mister E’s creative art pieces. He takes society’s love of banknotes to an entirely new level by creating a colorful bold currency for art lovers around the world. From single dollar bills to hundred dollar bills, his creations are a unique take on an everyday item. Mister E (b. 1987) is the Miami based artist, known for his colossal & colorful interpretations of US currency. “The art of money” is more than a phrase when it comes to Mister E’s creative art pieces. He takes society’s love of banknotes to an entirely new level by creating a colorful bold currency for art lovers around the world. 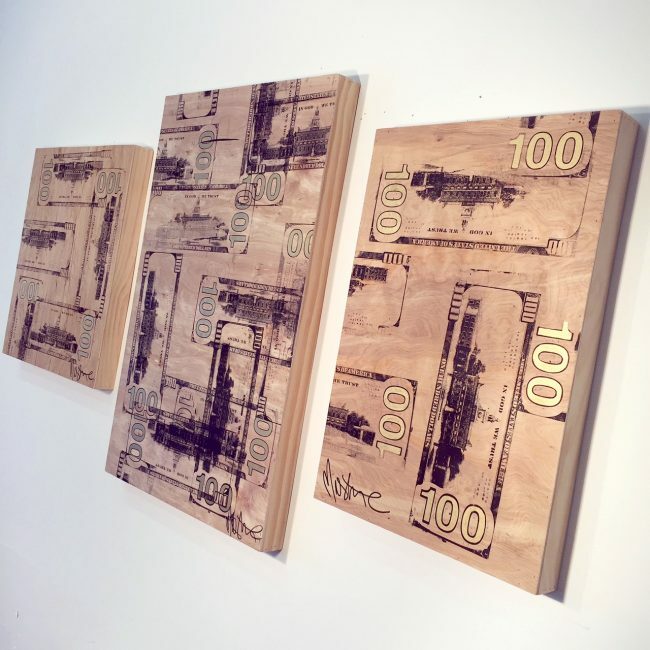 From single dollar bills to hundred dollar bills, his creations are a unique take on an everyday item. Mister E did not start out the world of art. He fought his talent as an artist, graduating with a bachelor’s degree in Construction Design and Real Estate. His timing could not have been worse, entering the real estate market when the US economy had hit rock bottom. He struggled to find purpose in such a stagnant industry. After about 2 1/2 years, he had witnessed the powerful effect that money had on every individual, and the way it controlled society. That’s when he decided that he must create his own currency, and build the value on his own, so that no one could take it away from him. Through his diverse body of work, Mister E provokes viewers to think about money in a totally different way than ever before. His colorful painting of the 2009 series $100 Bill titled “Benny Jr.”, has quickly become recognized internationally. As his work has evolved, he has changed the way in which people view money. His goal is to take away the evil connotation that most associate with money, and instead use it as a symbol for motivation, inspiration, and freedom. His paintings are collected by celebrities such as Floyd Mayweather Jr., Miley Cyrus, Lionel Richie, Scott Disick & Adam Sandler. One of his current projects includes a custom piece for Super Bowl MVP Von Miller. His works have been seen on television networks like CNBC, SHOWTIME, and Bravo. He has worked on activations for ULTRA Music Festival, Burning Man, and Coachella. He Launched $100,000,000 into a crowd of 100,000 people with DJ Snake and recently collaborated with Billboard #1 recording artist D.R.A.M. for his new single, “Cash Machine”. Mister E’s work has become largely popular amongst many institutional art collections, especially in the real estate and financial worlds. Most importantly, his artwork has helped raised money and become a symbol of charity for many well known organizations. Mister E’s studio The FactorE located just north of Miami, FL. It is a massive 10,000 sq. ft. warehouse, filled with exotic cars, full bar, movie room, billiards table, and of course the 100 year old 6ft grand piano which he covered in gold.